I graduated from JR Tucker High School in the spring of 2016 and am currently attending J Sargeant Reynolds Community College, studying dietetics. I started Tae Kwon Do when I was eight years old with AIM. I became a junior instructor when I was a purple belt, helping in front of the class and teaching small groups. I have been on demo teams and have demonstrated for several events throughout the years. In addition to self-defense training, I also learned multiple weapons including bo staff, nunchucks, and katana. I received my black belt in June of 2015 after nine years of training and hard work. I believe that it is important for young children and even adults to have training in martial arts and self-defense techniques, which teaches discipline, respect, and perseverance. It also teaches character building and how to survive daily struggles that may arise in life. Everybody learns in their own way and at their own pace. Tae Kwon Do has taught me how to overcome challenges, both mentally and physically. I feel I represent my black belt even when I am not wearing it. I received a black belt in Hokori Shin Karate in 1992 through Master George Crump. I've been an instructor with AIM USA since 2010. I decided to become an AIM self defense instructor because they provide affordable martial arts which allow more people to participate in the activity. I currently provide self defense instruction at the Chesterfield County location (Bon Air Elementary). You can learn more about my teaching methods on my class website or by joining our class Facebook Group. I graduated from Salem High School in the spring of 2013. I am currently attending TCC for my degree in civil engineering. I am hoping to transfer to ODU after getting my associates degree. I started Karate when I was 12 years old and have been doing it ever since. I am currently a 2nd degree black belt. I am also an eaglescout and have been involved with boy scouts since the first grade. I belive that boy boy scouts and karate go hand in hand due to the fact that both require you to put time and effort into achieving the end goals that you want. I started Martial arts training at age 5 through Athletes In Motion (AIM). I received my training through several respected AIM instructors. As a Brown Belt, I started assisting as a junior instructor under the guidance of former AIM instructor, Steve Mann. 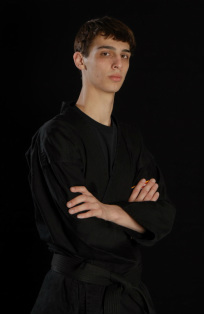 I proudly received my Black Belt on March 31, 2007 at the age of 15. I graduated from Virginia Commonwealth University in the Spring of 2014 and have been an instructor with AIM since 2008. Many students stay together for several years on the road to receiving their Black Belts. During this time friendships and bonds are formed as well as learning self-defense, self-awareness while being part of our "DOJO" family. I have a website for students and parents to share info on classes/cancellations/downloaded Katas, etc. "Having a Black Belt does not mean it is the final destination for Martial Arts, rather just the beginning of the journey." I started Tae Kwon Do at the age of 6 at Yoo’s Tae Kwon Do Academy. I then studied under Master Solomon Lee at A+ Martial Arts where I received my Black Belt. In 2004 I moved to Gentle East Martial Arts where I studied under Master’s Bernard and Barbra Robinson. In August of 2007 I achieved the rank of Second Dan. I started with teaching with AIM in 2003 with Tony Western. I also spend eight to ten hours a week teaching all levels and ages at Gentle East. In addition, I am a captain of the Competition Team and have been competing in Olympic Style Tournaments for the past three years. USAT World Team. Josh is in the white head gear and red chest protector. I am a 2nd degree Black Belt in Okinawa Shorin-Ryu. 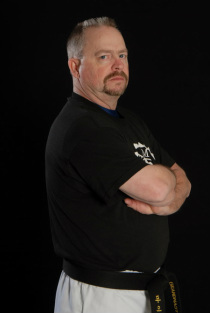 I've been in the martial arts for more than 20 years and has been with the AIM program since 1995. 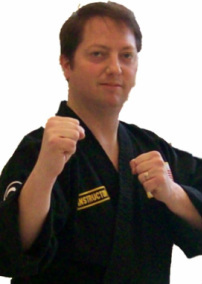 I currently teach self defense classes at the Arlington location. I'm a proud father of 5 children. Four children live in Michigan with their mom and my youngest son lives with my wife, Sharon, and I in McLean, VA. I believe that everyone has confidence but some have forgotten how to use it. I am here to not just teach you how to kick, block, punch and defend yourself, but to also teach you that you have a voice, you have a choice, and no one can take that away from you. Martial Arts is a way of life. It will change your life, how you present yourself, how you speak in front of a group and even how you walk down the street. Let me introduce you to the confident voice that has been hiding inside. I am excited to be part of the AIM instructor team. I love martial arts. I would watch Kung Fu movies and Bruce Lee with my dad when I was a kid. We started karate together when I was 6 years old. I've been training ever since ( a combined 29 years with two styles of martial arts). I started in a Shotokqn style called Kyokushin Kai Kan. Then, in college, on the campus of Clemson University ( go Tigers! ), I joined a club called Cuong Nhu, which is a very interesting mix of hard and soft style martial arts. I currently train and teach Cuong Nhu at Zanshin Dojo in Richmond. I am a 1st degree Tae Kwon Do Black Belt. I have been in martial arts for more than 20 years and have been with the AIM program since 2004. I currently teach Self-Defense classes in Waynesboro, Charlottesville, Albemarle and Augusta Counties. I have been a resident of the area for most of my life. My philosophy is that Self-Defense not only teaches you the basic ways to protect yourself but also give you a voice of self-confidence and it will change many aspects of your life. It will help you tackle all types of challenges. I want my students to become fit, more confident, able to defend themselves and have a good time. I have been working for AIM since 2013. For me, I have always been a kid at heart and therefore I will always be one. This is why I love working with kids. I received my black belt when I was 16 years old. One of the things that I've learned in my past 10 years of trying to achieve my black belt; is that when you have been carrying a weight on your back and you want to break free you have to make yourself want it bad enough to break it yourself. CC Wells. I have my own website to show cancellations and upcoming news. 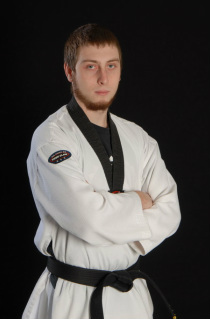 I have been a 1st Dan in the art of Tae Kwon Do for about 15 years and have been an instructor with AIM since 2000. I live in the Richmond area with my wife Deborah and my two sons -one who is also a 1st Dan in Tae Kwon Do. I currently instruct classes in Hanover and Henrico counties. I believe that all children should know what to do to get away from someone and to protect themselves.